In 2016, the Virginia Department of Housing and Community Development (DHCD) awarded Pulaski a grant to help fund several redevelopment projects in the town’s historic district. 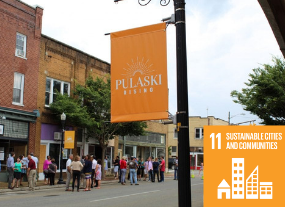 The grant kicked off a strategic planning process, which resulted in the Downtown Pulaski Revitalization Plan. The pilot project for the Revitalization Plan is the redevelopment of two downtown buildings. The initial development at 89 West Main Street will produce seven units for downtown Pulaski – four residential workforce housing apartments, and three ground-floor units for commercial and retail use. VCC provided financing for construction costs and a bridge loan until the development can collect proceeds from historic tax credits. Part of VCC’s enthusiasm in the project is the community support of the developer, Steve Critchfield. The Pulaski native is a proven entrepreneur and real estate professional and has a strong interest in helping revive the region. In addition, the project is managed by Taylor Hollow Construction, a reputable firm, and longtime VCC partner that gave lenders further confidence in the project’s success. These two developments are a significant step forward for a community-wide vision of a new downtown Pulaski: a more livable district oriented to outdoor recreation, commerce, arts, and culture. VCC’s mission is to promote a better quality of life for all Virginians, and part of our mission is fulfilled by promoting vibrant communities. The key to creating energized places like the Pulaski downtown starts with high-impact real estate developments such as 89 West Main that can spur residential growth, job creation, and an improved quality of life.